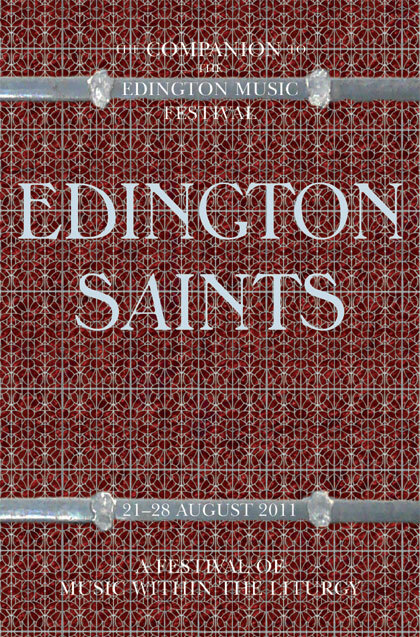 Welcome to the 2011 Edington Festival of Music within the Liturgy. It comes in the middle of a year of great celebration for the village of Edington as they mark 650 years since the consecration of the Priory Church. The fifty-six-year life of the music festival seems only momentary in comparison to these six and a half centuries, but the church has been the beating heart of the music festival since its humble beginnings in 1956. For festival participants and visitors alike, Edington Priory Church has become a special place of musical, spiritual and personal significance to which they return, year on year. How blessed we are that the people of Edington embrace this annual celebration of music and worship and have taken it to their hearts as much as those who take part in it. For me, the long history of the Priory Church only serves as a reminder of our own mortality. People will come and go, but through the guardianship of those who serve it, Edington Priory Church will continue to stand as a powerful sign of God’s constant and unchanging presence in a continually changing world. The history of the church is important, and the stories it has to tell can inform, teach and guide us on our own spiritual journeys. At the heart of this history are Edington’s Saints. Why are these saints so important? In the fourteenth century, when William of Edington built the Priory Church, the saints were ‘heroes for God … needed as protecting, comforting, helping figures in the midst of the changes and chances of hazardous living’ (Dr Marjorie Reeves, lecture to the Friends of Edington Church, 23 August 1980). The hazards of today’s world may be different, but the examples of the saints are no less relevant. As you enter the church, look up to the windows which face you high above the North nave aisle. Here survive depictions of six saints who have looked down on us from their place in the Clerestory throughout the church’s 650-year history. It is staggering to think that originally these were part of a much larger frieze of some thirty-six saints; too many to address during a one-week music festival. It is these ‘heroes of the Faith’ that we contemplate in our worship this week, along with those to whom Edington Church is dedicated: Saint Mary, Saint Katharine and, appropriately, All Saints. Why these particular saints were chosen for Edington is a matter of debate. Some are well-known ‘giants’ of the Church: Saint Paul, whose ardent preaching of the Gospel following his dramatic conversion is the subject of our services on Monday; Saint Christopher, the ‘bearer of Christ’, patron saint of travellers and sailors, and Saint Katharine ‘of the Wheel’, fourth-century martyr put to death as she sought fervently to convert others to Christ. As the patron saint of scholars, philosophers and preachers, Katharine has become a religious role model as one highly learned and wise, murdered for preaching the Gospel. On Wednesday we explore the lives of two lesser-known French saints, Audon and Leodegar, who are patrons of the deaf and blind respectively. In doing so, we meditate on Christ’s miracles of healing and the metaphors contained within them for all of us to have our eyes and ears open to the Gospel. We look forward to welcoming The Reverend John Cowburn, Chaplain with Deaf People in Salisbury Diocese, to share in the Eucharist on Wednesday morning. Two other saints have obvious regional associations: William, eleventh-century Archbishop of York, and Saint Cuthbert of Lindisfarne, famed for his piety, diligence and obedience. Cuthbert’s solitary existence as a hermit and his oneness with the wildlife of Holy Island was well documented, leading him to be held up as a guardian of God’s creation, something we celebrate in word and music on Friday morning. We welcome as our visiting Preacher at Friday’s Sung Requiem the Reverend Canon Dr Stephen Cherry, Director of Ministerial Development and Parish Support for the Diocese of Durham and Residentiary Canon of Durham Cathedral, home to the Shrine of Saint Cuthbert. Twentieth-century hymn writer Fred Pratt Green suggests that ‘a world without saints forgets how to praise’. The lives of the ‘Edington Saints’ certainly provide inspiration enough to praise God through a wealth of choral music from all six and a half centuries of the history of Edington Church. Indeed, Thursday’s Sequence of Music traces that history in music, from a medieval hymn to Saint Katharine by Byttering to Britten’s great celebration of God in Creation, Rejoice in the Lamb. George Herbert, who was married in Edington Church in 1629, wrote his Antiphon II in 1633 which speaks of us ‘here below’ and the angels and saints ‘here above’. It is Britten’s setting of this text which is sung as the anthem at Wednesday’s BBC broadcast of Choral Evensong. As always, hymns are another important part of our worship, and I am particularly pleased that this year we will sing both texts and tunes by some excellent contemporary writers, including festival participant John Barnard, whose tune Edington will be broadcast at the end of Wednesday’s Evensong in celebration of the church’s 650th anniversary. 2011 marks the quatercentenary of the death of Tomás Luis de Victoria, the greatest composer of the Spanish renaissance. We observe this important musical anniversary with a complete performance of his Missa pro defunctis at Friday’s Sung Requiem, and his joyous twelve-part Missa Laetatus sum at the final Eucharist of the festival. Another significant quatercentenary is of course that of the Authorized Version of the Bible, completed on the instruction of King James I in 1611. It is this version of the Bible that we will be reading from at Evensong and Choral Matins during the festival week. As well as many familiar faces, I am delighted to welcome many new participants to this year’s festival. I thank all the musicians for giving of their time and talents to make the festival what it is and bringing such joy to the many people that come to hear them. A particular welcome to Benjamin Nicholas, Director of the Tewkesbury Abbey Schola Cantorum and Reed Rubin Director of Music at Merton College, Oxford, who directs the Edington Schola for the first time this year. My thanks to him, to Jeremy Summerly (Director of the Consort) and to Matthew Martin (Director of the Nave Choir) for their rich contribution to the life of the festival, and to Organists Peter Stevens and Chris Totney for their playing throughout the festival week. Amongst the clergy team, we welcome for the first time The Reverend Canon Chris Chivers, Vicar of John Keble Church, Mill Hill, following his visit to last year’s festival as our guest preacher. As always, we are indebted to the people of Edington whose generous hospitality and dedicated work behind the scenes make the festival possible. My thanks to the Reverend Dr Graham Southgate, Vicar of Edington, for making us welcome in his church and to the wonderful team from the village who play such a significant role in putting the festival together: Robin Wilson, Clare Norfolk-Brown, Christine Laslett, Peter Norfolk-Brown, Julia Taylor, John d’Arcy, Allan Edwards, Sheila Miles and Chloë Watts. On the festival side, my thanks to Nick Flower, John Barnard, Adrian Hutton, Hugo Janacek, Helen Grote, Eleanor Lane and Emily Roberts, all ably drawn together by the Festival Administrator Peter Roberts without whose hard work the festival would cease to function. In this historic 650th anniversary year, I am reminded of the importance of looking forward as much as looking back. Throughout its history the festival has placed importance on the value of new music for the church, and this year is no exception. At Wednesday’s Evensong the Nave Choir will sing a new set of Responses composed for this year’s festival by Professor John Harper, Festival Director 1971–78 and former Director of the Royal School of Church Music. Professor Harper is also a Vice-Patron of the Edington Organ Project, and has generously donated his fee for this commission to the organ appeal. The Edington Organ Project appeal will be launched formally following the Eucharist on the final Saturday of the festival by Appeal Patrons Lady Barbara Calcutt, whose late husband Sir David founded the festival, and Simon Preston, the first Organist of the festival. I do hope you will be able to join us for a celebratory drink and to hear about the plans for this exciting new chapter in the history of the festival and the church. In 1361 William of Edington had the vision to build this most beautiful Priory Church to the glory of God. Some six hundred years later, David Calcutt and Ralph Dudley had the vision to create a music festival ‘in which God is worshipped through beauty—beauty of sight, shown or seen in stone or ceremony, beauty of sound, made or heard in the word sung or spoken’. It is now our turn in 2011 to have the vision to create something new which will serve the church and those who will visit it and worship in it for generations to come. Please consider supporting this important project as generously as you are able. Our prayer is that, when our generation is gone, future generations will still be gathering in the beautiful surroundings of Edington Priory Church, making fine music to the praise of God, saying, like Jacob, ‘How awesome is this place! This is none other than the house of God, and this is the gate of heaven’. I hope you enjoy the 2011 festival.